Sustainable Developmental Goal 3 (SDG 3) aims to ensure healthy lives and promote well-being for all at all ages. The graph above shows average life expectancy at birth for both males and females for the five regions, Europe, Africa, Asia, Pacific and Caribbean and Americas for the 2011 and 2016. Life expectancy at birth is defined as the number of years a new-born infant would live if prevailing patterns of mortality at the time of its birth were to stay the same throughout its life. For the given years, Europe had the highest average life expectancy for both males (79.08, 2016) and females (83.16, 2016) while Pacific (males: 56.53, 2016, females: 60.42, 2016) had the least. Africa witnessed the highest gain in average life expectancy for both the genders: 4.88% increase in average life expectancy for males and 5.22% increase in females. Note: No data available for Dominica, St. Kitts and Nevis, Nauru and Tuvalu. 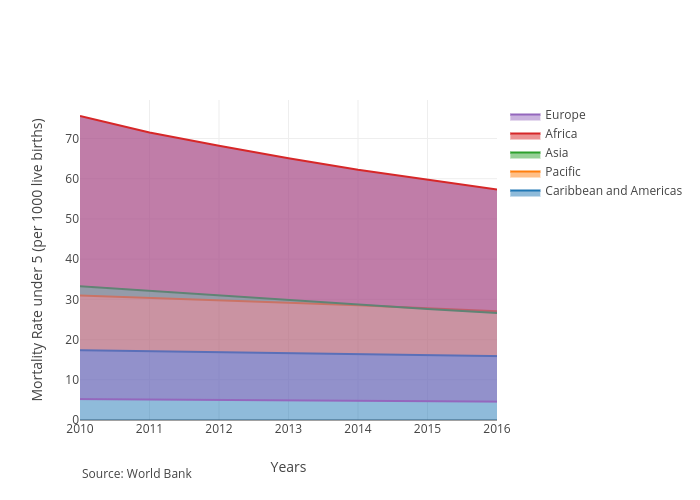 The graph above shows under-five mortality rate for five regions, Europe, Africa, Asia, Pacific and Caribbean and Americas for the time period 2010 to 2016. The under-five mortality rate is defined as the probability per 1,000 that a new-born baby will die before reaching age five if subject to age-specific mortality rates of the specified year. Over the six-year period, the mortality rate has gone down for all the five regions. The percentage decrease from 2010 to 2016 was highest for Africa, which witnessed a 24% decrease in the mortality rate while the decrease was the lowest for Caribbean and Americas at 8%. Africa had the highest under-five mortality rate for this period while Europe had the lowest. As of 2016, Africa’s under-five mortality rate was 57.31 while Europe’s was at 4.57.